We’re excited to announce our brand new, state-of-the-art location in the Heath Brook area is now open. Located in the Market St. Plaza at 4414 SW College Rd., Suite #1462, Ocala, FL 34474, the office is situated directly above Panera Bread. 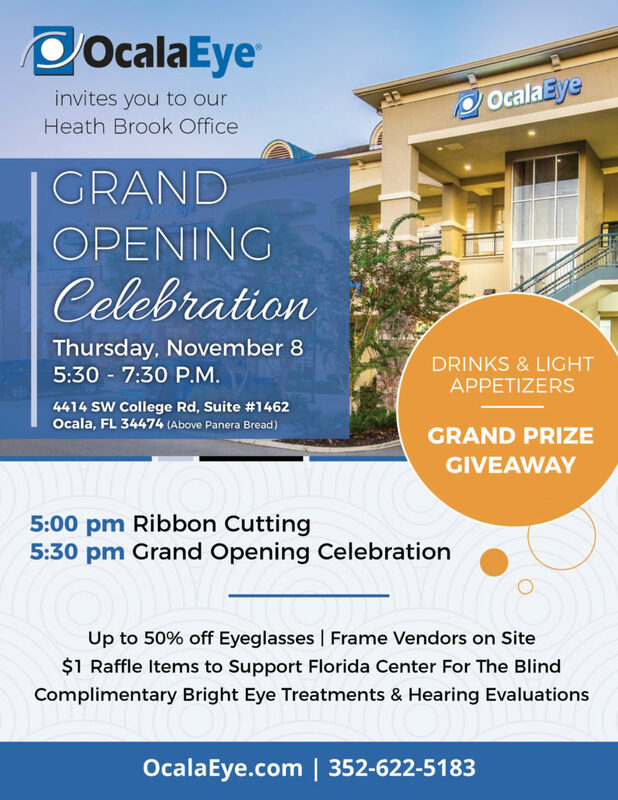 The new Ocala Eye Heath Brook office offers a centralized location to get all of your ophthalmology, aesthetic, optical and hearing services performed under one roof in a warm, welcoming and convenient location. As a result of the move, the Paddock Park office is now closed and the Magnolia office will focus exclusively on offering comprehensive optometry services. The new office will offer the same level of care and expertise patients have come to expect from our team specializing in cataracts, glaucoma, cornea and retinal diseases. a short walk to the front elevators.